The local authority already spends about £20,000 every year clearing up litter collected from roadsides across the region. However, that total does not include the cost of disposing of the vast quantities of rubbish and plastic cleared from beaches to be dumped in landfill. 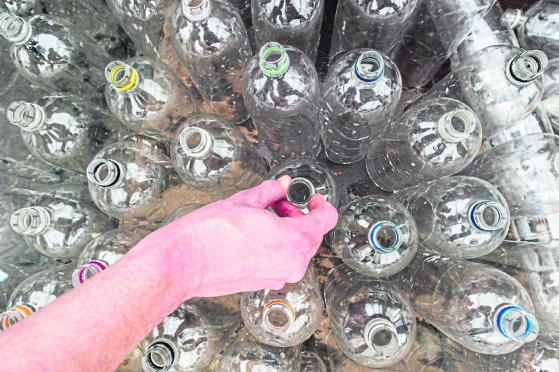 Yesterday, the council’s policy and resources committee unanimously backed proposals to stop buying the plastic where “practically possible”. Senior management stressed the current drive to trim £14million from next year’s budget meant they would be unable to spend extra money on the initiative – unless funded by an external grant. But Speyside Glenlivet councillor Louise Laing believes it was important that the council set an example for others to follow. She said: “At the moment we are fighting a losing battle. The only way to make a difference is to actually stop buying the plastic. “I do my best in the supermarket but I’ve seen broccoli that is cheaper when it is wrapped in plastic – somewhere people are making money off it. Moray Council has already changed the plastic used in schools for sandwich wedges away from a disposable option. Meanwhile, paper cups are now used at water coolers in the headquarters and annexe buildings in Elgin and plastic cutlery is only used in schools when dishwashers have broken. Forres councillor George Alexander backed the drive but warned it was important not to get “carried away by idealisms”. Council leader Graham Leadbitter said: “When beach cleans are done there is a massive cost to the council to collect the rubbish and put it in landfill.